Unique styling combines with some smart enthusiast touches for gaming-keyboard goodness. Gaming peripherals are afraid of color. Actually, I’d wager this is an issue that goes beyond peripherals to technology at large. White, black, silver, and gray are the standard pallete. Anything else is relegated to an accent at best. Apple made waves in the ‘90s with those teal iMacs, and then what happened? A decade later they were back to “Space Gray” and other neutral tones. But if Mionix’s new peripherals are anything to go by, an injection of color might do us well. I’ve been using the Mionix Wei off and on for a few months now, and you know why I keep coming back to it? Because it’s damn pretty. The Wei is Mionix’s first keyboard since 2011, which is a big deal. 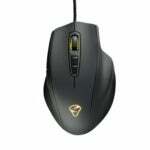 In the same way that the HyperX brand is known for headsets, Mionix has been primarily known for one thing: mice. And I’m a huge fan of them too, both the NAOS 7000 and the smaller Castor mice. For a no-name company, Mionix quickly proved it had an eye for ergonomics that few other companies could match—and an eye for design. Mionix mice look elegant, a trait that was especially rare three or four years ago (though thankfully less rare today). 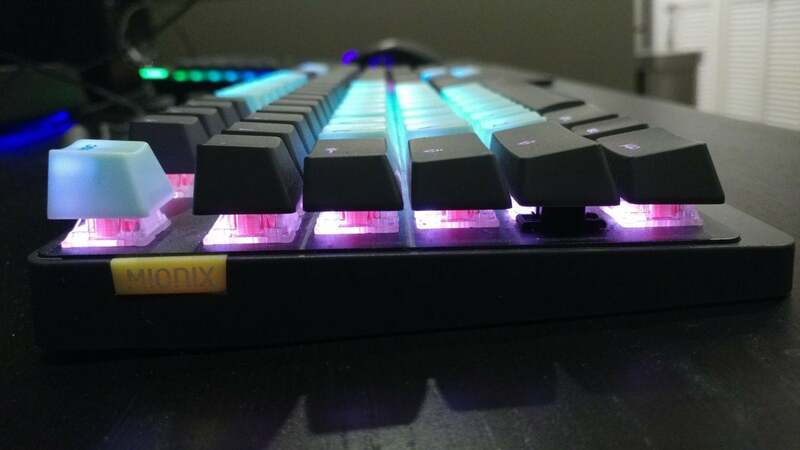 It’s no surprise then that Mionix’s first keyboard looks more like an upscale boutique model than a “gaming keyboard,” in the traditional sense. By default, the keyboard ships in slate gray, with barely any visible branding. Keys are adorned with a wispy sans-serif, about as minimalist as it gets. And a quirky touch? 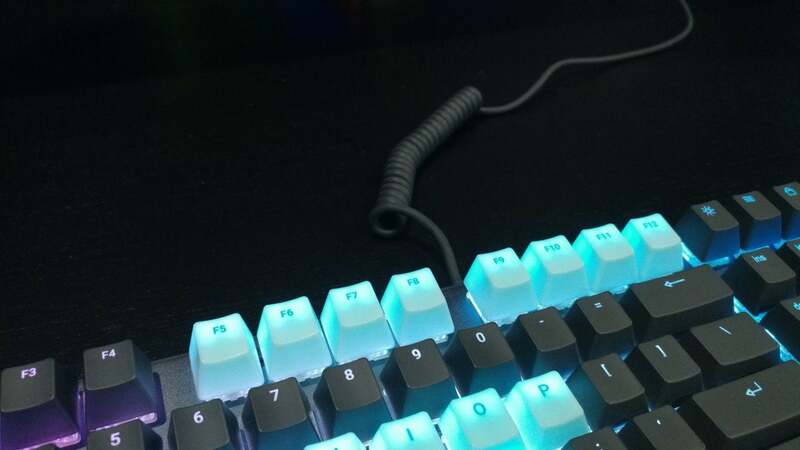 The Wei uses a coiled telephone-style cable, like the IBM Model M and other classics. That feature has made a comeback in enthusiast circles in recent years, but it’s still surprising to see it on a mainstream model like the Wei. Mionix seems dead set on winning over that enthusiast/gamer cross section though, offering colored keycap sets as well. This is where the real fun is found. Mionix sent over a set of ice blue (or “Ice Cream,” to use their name) keycaps to go along with the Wei. It’s gorgeous. 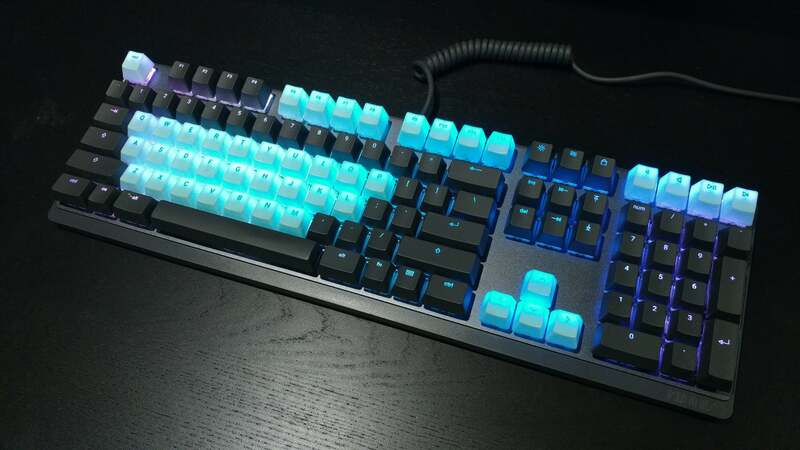 The contrast between the opaque gray and translucent blue keys is eye-catching, to say the least. You could, of course, opt to replace every key with its blue substitute—or not bother, and stay gray—but I’ve found a combination of the two to be most appealing. 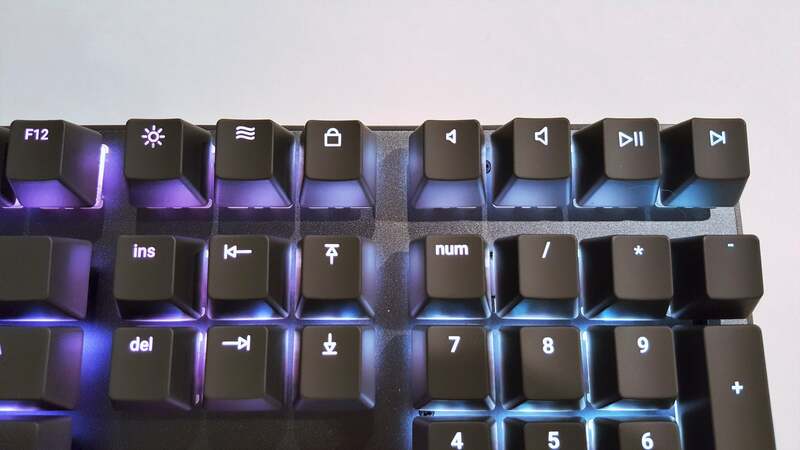 Mionix isn’t the only company to offer custom keycaps. We’ve reviewed the WASD V2 in the past, for example—a keyboard you design on the website with any number of custom colors. 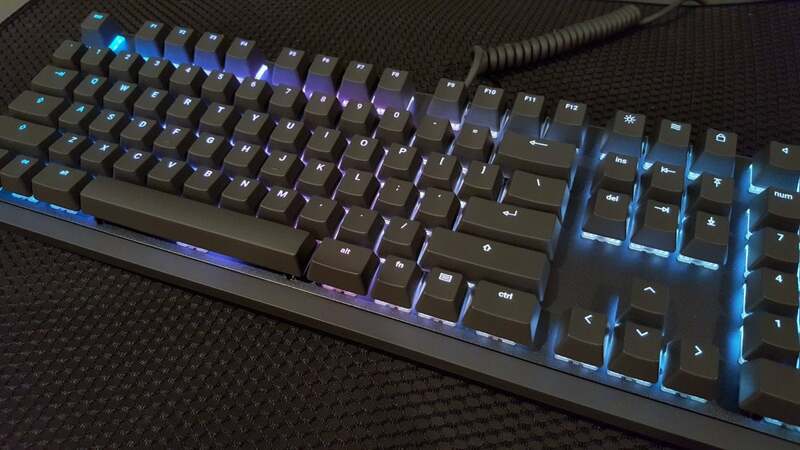 It’s also easy to buy keycaps through a third party for any board with Cherry MX switches—PMK is a popular choice with enthusiasts. Mionix is offering this option in-house though. They’re ABS caps, not the more upscale (and durable) PBT plastic—a bit disappointing. It’s also pricey, coming in at $39 for a full set, which albeit comparable to other ABS replacement sets is still probably more than the average person wants to spend. Even so, it seems smart for Mionix to make this play as a niche enthusiast company. The practice of replacing keycaps has been popular in enthusiast circles for a while—one look at the mechanical keyboards subreddit is proof enough. Great to see a gaming company lean into the trend. Other companies could (and should) learn from Mionix’s example. I don’t know if every company needs to have a stockpile of colorful custom keycaps on hand, a la WASD, but some variation would be nice. Even better if keyboards would ship with that option, instead of requiring a manual swap-out like the Wei. But first they should take cues from Mionix’s RGB lighting. See, every other RGB keyboard I have on hand defaults to the same neon rainbow: red, orange, yellow, green, blue, purple—eye-searing and as simple as a toddler’s basic crayon box. Some pull it off better than others, with Corsair’s K95 and its unique light bar probably top of the heap. But it’s all very similar, very rudimentary. The Wei is subtler, defaulting to a rotation of pink and purple pastels that play well with the default gray keys and complement the custom blue ones. If you want the neon RGB colors you can find them in Mionix’s software obviously, but the Wei is perhaps the only keyboard I’ve left on the default setting for weeks on end. It reminds me of an aurora, and I really, truly adore it. Design is what sets the Wei apart, in other words. Nevertheless, Mionix has always been good about pairing its unique aesthetic with enthusiast-quality parts, and the Wei is no different—it’s a beautiful keyboard, for sure, but underneath the shiny exterior you’ll find familiar industry-standard Cherry MX switches. Five years ago that would’ve been obvious, but in 2018 it’s almost surprising. There are so many Cherry clones nowadays, and most (maybe all) of them available at a cheaper price. One by one I’ve watched companies either design a proprietary switch a la Razer, or start using a Cherry knock-off like Kailh or Outemu. 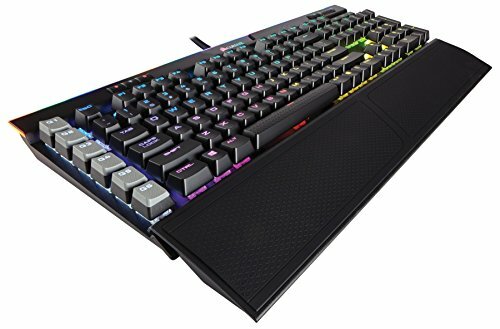 Only Corsair, HyperX, and a few others are using Cherry RGB switches. And now Mionix, evidently. Perfect, as far as I’m concerned—I still heavily favor Cherry MX Blue switches for day-to-day typing. Cherry switches are durable, reliable, and consistent. That’s about all I could ask for. 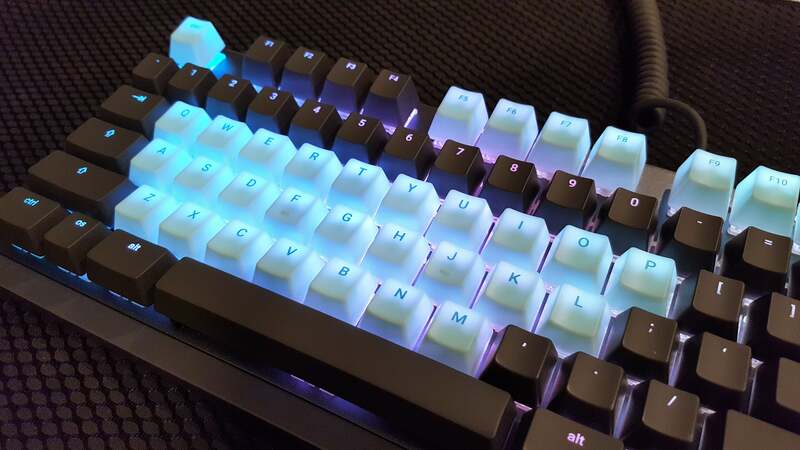 The only downside is, like any Cherry or Cherry clone, the RGB lighting is slightly offset towards the top of each key to accommodate for the switch’s “stem” design. This still annoys me at times, especially since keys with dual functions (like the number row) typically illuminate one input and not the other. But I’d still take the Cherry typing experience over any of the switches that claim to have “solved” that problem. Oh, and price. Price is the other downside. 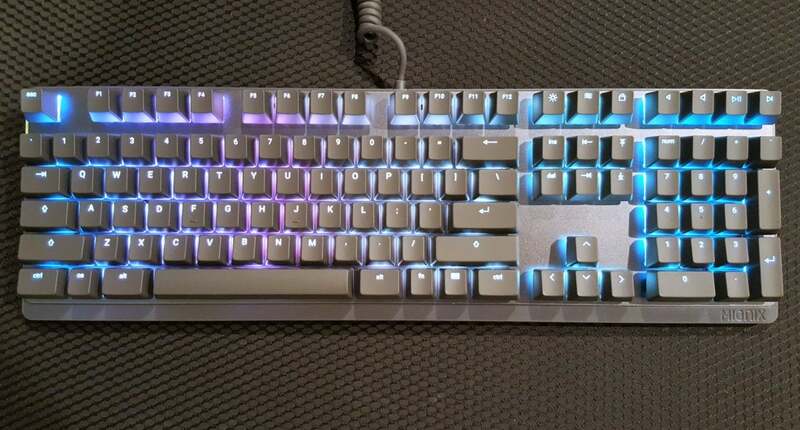 The Wei comes in at $159, and that’s before you order any alternate keycaps. That’s one hell of an expensive keyboard, presumably due to some combination of quality components and limited-run manufacturing—after all, Mionix is still a pretty niche company. It works against the Wei though, especially since it’s relatively feature-bare compared to the competition. You have to really love how it looks. Fortunately I do love how it looks. I think the Mionix Wei is one of the prettiest keyboards to ever cross my desk, and even more so after swapping in some of the optional blue keycaps. It’s stunning, and the aforementioned Corsair K95 is probably the only other keyboard that even comes close. Sure, it’s pricey. Probably too pricey for the average person. But with one fell swoop, Mionix has upturned all conventions of what a “gaming keyboard” should look like—just like they challenged assumptions about gaming mice with the NAOS 7000. Change is habit-forming, I guess. I expect the Wei will remain a niche product, but I also think those who end up with one will absolutely love it, and that’s really all anyone can ask. The Mionix Wei is pricey and somewhat feature-bare, but it's also one of the most beautiful mechanical keyboards on the market and takes some smart pointers from the enthusiast crowd.